This was no ordinary storm, with ridiculous quantities of snow deposited across Austria, but there were also many chasing it. Still a week after the storm retreated, there are many untracked banks of bottomless powder to be enjoyed. Over the weekend we were in the trees of Mutters, a family ski area above Innsbruck and an ideal location for corporate skiers looking for a rapid transit from the city into the snow. The previous week we had been evacuated off the mountain due to the incessant snowfall. 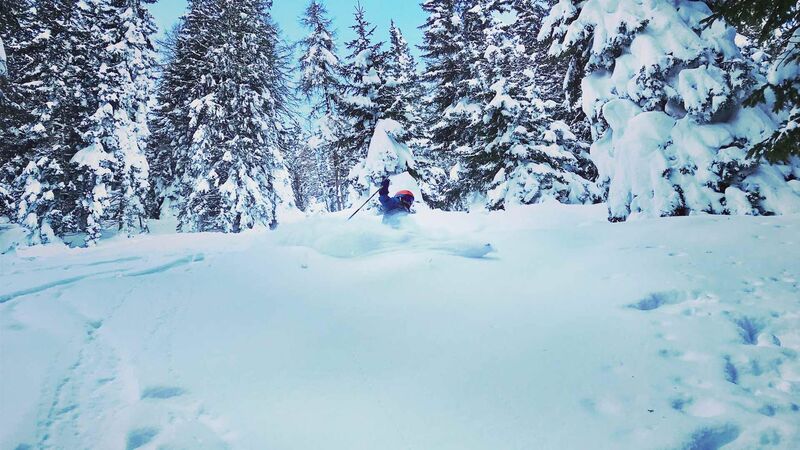 A week later and bottomless powder could still be found in the trees next to and between the main ski pistes. With a view onto the city, down in the valley, the tree skiing had a spectacular backdrop. Yesterday we made a trip down the valley to Ischgl, for another day of powder. The forecast had been for overcast skies, instead there was hazy sunshine and further fantastic snow. Some you win, some you lose. We traversed deep into Piz Val Gronda, expecting banks of awesome powder and all we got was a 20-minute descent on wind-blown crud. Great on the eye (from afar) but a pig to ski on. Heading back inbounds, we found a powder stash next to a chair and spent the afternoon flying though knee-deep snow, gradually extending into the forest. Sometimes the best snow is right under your nose. Cold, cold weather this week, followed by snow at the beginning of next week. Believe the hype, winter 2018/19 is out of the ordinary in Austria.